The hotel is situated within walking distance of the main attractions of Bristol and is easy to get to from Bristol Airport by bus. Check our tourist information page to see what attractions and events you want to visit on your stay . Rooms big enough. Bed could be a little softer. A comfortable chair would be a good addition to the room. Dear Mr S., We very much appreciate your comments regarding your stay at the ibis Bristol Temple Meads Quay. It is always a pleasure to receive feedback. I will share your comments with our team. I am sure that this feedback will serve as an encouragement to all of our staff as we strive to continuously improve the quality of our services. Thank you again for sharing your experience, and we hope your next visit will be as pleasant as the previous one. Sincerely, Julien de Lagausie General Manager. The hotel was in a good location, the staff were nice but some of them were hard to approach. The girl who checked in us in were nice however on the second night my sister wanted more pillows in her room because she was staying with my parents in the family room. I asked the girl in the reception that evening and it felt like she didnt want to help, she said she will ask her colleague to do it, she was already sitting down using the computer so she was shouting for her colleague to come out of the office, when the man came outside, he said he will check, i asked them if they can send it upstairs because i was having dinner with my boyfriend, we saw that they put the pillows by the counter but didnt deliver it right away, they didnt seem to want to deliver it as they were taking their time, my boyfriend saw them and decided to come to reception and just deliver the pillows himself to my sister. I was a bit disappointed as they were not really busy and took their time talking to each rather than delivering the pillows right away. Another problem on the 2nd day was i was in the shower and my boyfriend was getting ready to go out, we coudnt find the sign for the do not disturb so there was nothing on the door that says do not disturb, while i was in the shower my boyfriend said housekeeping came in without knocking and my boyfriend was half naked, she got shocked so she left right away. I was a bit shocked when he said that as that should never happend, he was a bit embarrassed when he was telling me the story, i felt so bad and messaged reception to deliver the sign for the door right away. 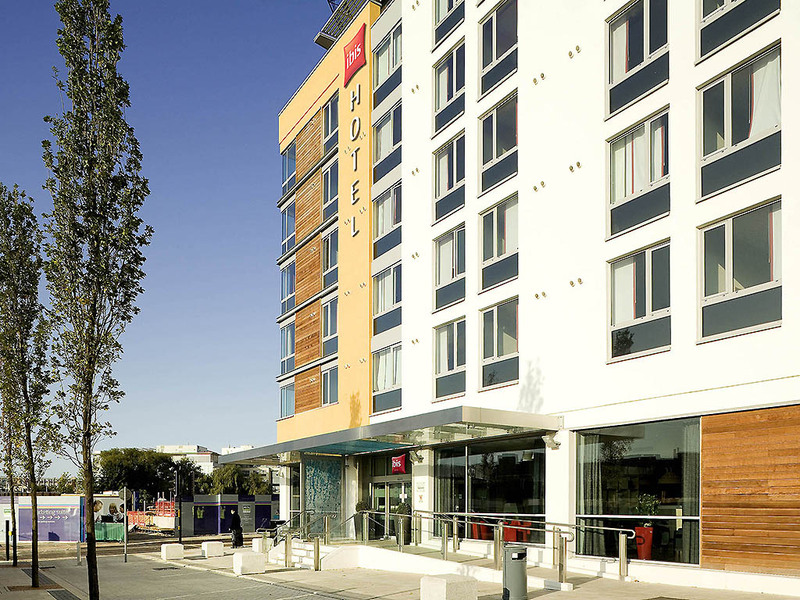 Dear Ms E., Thank you for taking the time to tell us about your experience at the ibis Bristol Temple Meads Quay. I am sorry that your experience did not meet your expectations; please allow me to express my sincerest apologies. At Ibis, we strive to provide a superior service experience for every customer; therefore your feedback is very important to us. Please rest assured that we are taking the appropriate measures to address the problem and prevent future occurrence. We appreciate your sharing your concerns, and it is our hope that you will give us the opportunity to better serve you in the near future. Sincerely, Julien de Lagausie General Manager. Pleasant stay. Nice quiet room. Friendly, helpful staff. Decent breakfasts. Nice view if you are keen on trains! Dear Mr M., We very much appreciate your comments regarding your stay at the ibis Bristol Temple Meads Quay. It is always a pleasure to receive positive feedback. I will share your comments with our team. I am sure that this feedback will serve as an encouragement to all of our staff as we strive to continuously improve the quality of our services. Thank you again for sharing your experience, and we hope your next visit will be as pleasant as the previous one. Sincerely, Julien de Lagausie General Manager. Service was very good - everyone was helpful & there is no problem in recommending the hotel ! Very pleasant - all staff were friendly and helpful. Just also to note, we needed a hotel which permitted dogs to stay. Dear Ms L., We very much appreciate your comments regarding your stay at the ibis Bristol Temple Meads Quay. It is always a pleasure to receive positive feedback. I will share your comments with our team. I am sure that this feedback will serve as an encouragement to all of our staff as we strive to continuously improve the quality of our services. Thank you again for sharing your experience, and we hope your next visit will be as pleasant as the previous one. Sincerely, Julien de Lagausie General Manager. Dear Mr K., We very much appreciate your comments regarding your stay at the ibis Bristol Temple Meads Quay. It is always a pleasure to receive positive feedback. I will share your comments with our team. I am sure that this feedback will serve as an encouragement to all of our staff as we strive to continuously improve the quality of our services. Thank you again for sharing your experience, and we hope your next visit will be as pleasant as the previous one. Sincerely, Julien de Lagausie General Manager. Good stay but difficulty closing bathroom door. Good room size and clean. Bathroom door was difficult to close and needed a big push to open when inside the bathroom. Also, not everyone is on What's App so would have liked a phone in the room. Dear Ms W., We very much appreciate your comments regarding your stay at the ibis Bristol Temple Meads Quay. I noted well your comments regarding the bathroom door and the phone in the room which we will address. It is always a pleasure to receive positive feedback. I will share your comments with our team. I am sure that this feedback will serve as an encouragement to all of our staff as we strive to continuously improve the quality of our services. Thank you again for sharing your experience, and we hope your next visit will be as pleasant as the previous one. Sincerely, Julien de Lagausie General Manager. Dear Ms A., We very much appreciate your comments regarding your stay at the ibis Bristol Temple Meads Quay. It is always a pleasure to receive positive feedback. I will share your comments with our team. I am sure that this feedback will serve as an encouragement to all of our staff as we strive to continuously improve the quality of our services. Thank you again for sharing your experience, and we hope your next visit will be as pleasant as the previous one. Sincerely, Julien de Lagausie General Manager. Dear Ms B., We very much appreciate your comments regarding your stay at the ibis Bristol Temple Meads Quay. It is always a pleasure to receive positive feedback. I will share your comments with our team. I am sure that this feedback will serve as an encouragement to all of our staff as we strive to continuously improve the quality of our services. Thank you again for sharing your experience, and we hope your next visit will be as pleasant as the previous one. Sincerely, Julien de Lagausie General Manager. Guest above us noisy all night. Bin cart directly under our window, collecting rubbish, noisy. Clubbers came back from club 6am, noisy. Paid £12 for a pizza - it was the equivalent of a £1 Iceland pizza Only good thing about it was the breakfast, it was good value for the money. Asked if we slept well by a member of staff in the morning, we said no, explained why and was ignored. Will not be returning to this hotel. Dear Ms T., Thank you for taking the time to tell us about your experience at the ibis Bristol Temple Meads Quay. I am sorry that your experience did not meet your expectations in particular with the noise experienced; please allow me to express my sincerest apologies. At Ibis, we strive to provide a superior service experience for every customer; therefore your feedback is very important to us. Please rest assured that we are taking the appropriate measures to address the problem and prevent future occurrence. We appreciate your sharing your concerns, and it is our hope that you will give us the opportunity to better serve you in the near future. Sincerely, Julien de Lagausie General Manager. For the price you pay, there is definitely better options in the city. Looks cheap, feels cheap. Dear Mr H., We very much appreciate your comments regarding your stay at the ibis Bristol Temple Meads Quay. It is always a pleasure to receive feedback. I will share your comments with our team. I am sure that this feedback will serve as an encouragement to all of our staff as we strive to continuously improve the quality of our services. Thank you again for sharing your experience, and we hope your next visit will be as pleasant as the previous one. Sincerely, Julien de Lagausie General Manager. Need better heating control. My room was too warm. Other than that everything was fine. Dear Mr B., Thank you for taking the time to tell us about your experience at the ibis Bristol Temple Meads Quay. I am sorry that your experience did not meet your expectations in particular with the heating control; please allow me to express my sincerest apologies. At Ibis, we strive to provide a superior service experience for every customer; therefore your feedback is very important to us. Please rest assured that we are taking the appropriate measures to address the problem and prevent future occurrence. We appreciate your sharing your concerns, and it is our hope that you will give us the opportunity to better serve you in the near future. Sincerely, Julien de Lagausie General Manager. Dear Mr F., We very much appreciate your comments regarding your stay at the ibis Bristol Temple Meads Quay. It is always a pleasure to receive positive feedback. I will share your comments with our team. I am sure that this feedback will serve as an encouragement to all of our staff as we strive to continuously improve the quality of our services. Thank you again for sharing your experience, and we hope your next visit will be as pleasant as the previous one. Sincerely, Julien de Lagausie General Manager. The staff here are all amazing, but I was in a room that wasn't very clean and I could hear the elevators moving all night which was disturbing. Dear Ms U., We very much appreciate your comments regarding your stay at the ibis Bristol Temple Meads Quay. I am sorry to hear your comments about the cleanliness of the room, please receive my sincerest apologies. It is always a pleasure to receive positive feedback. I will share your comments with our team. I am sure that this feedback will serve as an encouragement to all of our staff as we strive to continuously improve the quality of our services. Thank you again for sharing your experience, and we hope your next visit will be as pleasant as the previous one. Sincerely, Julien de Lagausie General Manager. Modern and clean hotel in good location though lots of building work around but no noise heard. Average sized medium rooms - you pay for what you get as no phone, no safe, no USB ports, no free parking, small TV, bedside lights too bright, no hand towels or flannels and very small bathroom which felt like an aeroplane bathroom. Ironing room on 4th floor. Good heating, nice shower, very near to river, restaurants and short drive from town. Need room key to get in, use lifts/stairs after about 10pm and parking costs £1 per hour between 9am-5pm, though one street away was free! My granddaughter and I enjoyed our stay. Great location, comfortable beds, lovely staff let down by lack of hot water. Refund offered immediately. Would definitely stay here again. Dear Ms F., Thank you for taking the time to tell us about your experience at the ibis Bristol Temple Meads Quay. I am sorry that your experience did not meet your expectations in particular with the boiler breakdown; please allow me to express my sincerest apologies. At Ibis, we strive to provide a superior service experience for every customer; therefore your feedback is very important to us. Please rest assured that we are taking the appropriate measures to address the problem and prevent future occurrence. We appreciate your sharing your concerns, and it is our hope that you will give us the opportunity to better serve you in the near future. Sincerely, Julien de Lagausie General Manager. Really good hotel and friendly staff, good breakfast each morning too. Would be a perfect hotel if it had a gym! Dear Mr P., We very much appreciate your comments regarding your stay at the ibis Bristol Temple Meads Quay. It is always a pleasure to receive positive feedback. I will share your comments with our team. I am sure that this feedback will serve as an encouragement to all of our staff as we strive to continuously improve the quality of our services. Thank you again for sharing your experience, and we hope your next visit will be as pleasant as the previous one. Sincerely, Julien de Lagausie General Manager. My stay at Ibis in Bristol was enjoyable, despite a boiler problem when we arrived. The issue was resolved the next day. Room was clean and tidy shower room ideal. It would have been good to have a snack vending machine somewhere as getting back late and wanting something to nibble with my cup of tea I was disappointed not to have the small package of biscuits often on tea trays in hotels but would happily have used a machine to buy something. Dear Ms K., We very much appreciate your comments regarding your stay at the ibis Bristol Temple Meads Quay. It is always a pleasure to receive positive feedback. I will share your comments with our team. I am sure that this feedback will serve as an encouragement to all of our staff as we strive to continuously improve the quality of our services. Thank you again for sharing your experience, and we hope your next visit will be as pleasant as the previous one. Sincerely, Julien de Lagausie General Manager. Dear Ms H., Thank you for taking the time to tell us about your experience at the ibis Bristol Temple Meads Quay. I am sorry that your experience did not meet your expectations; please allow me to express my sincerest apologies. At Ibis, we strive to provide a superior service experience for every customer; therefore your feedback is very important to us. Please rest assured that we are taking the appropriate measures to address the problem and prevent future occurrence. We appreciate your sharing your concerns, and it is our hope that you will give us the opportunity to better serve you in the near future. Sincerely, Julien de Lagausie General Manager. I have stayed at the hotel before. It is a great location, the staff are friendly and the rooms are good and comfortable as advertised. Dear Ms C., We very much appreciate your comments regarding your stay at the ibis Bristol Temple Meads Quay. It is always a pleasure to receive positive feedback. I will share your comments with our team. I am sure that this feedback will serve as an encouragement to all of our staff as we strive to continuously improve the quality of our services. Thank you again for sharing your experience, and we hope your next visit will be as pleasant as the previous one. Sincerely, Julien de Lagausie General Manager.